Roanoke, Virginia (October 19, 2016) - On Saturday November 5th, 2016 from 10:00AM – 3:00PM Roanoke County’s Explore Park will host the final Artisan Saturday of the 2016 season. This event is FREE and fun for all ages. Many gift shop items, excluding Artisan items, will be reduced for an end of the season sale. 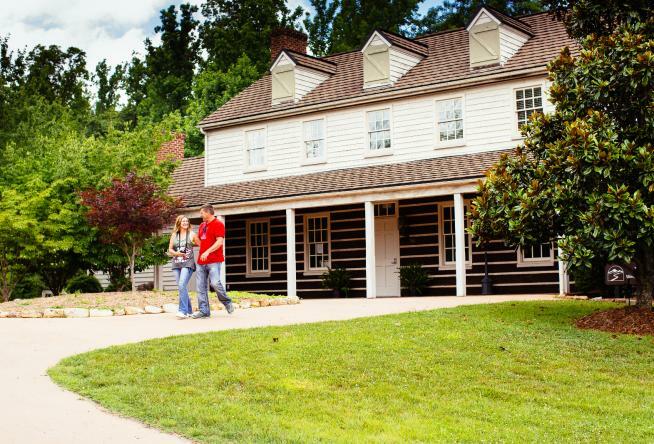 Located on the Blue Ridge Parkway, at milepost 115, the Blue Ridge Parkway Visitor Center and Gift Shop will have local artisans on hand to demonstrate a number of uniquely different crafts and skills. Included in the lineup will be fused glass artisan Nancy Erikson of Union Hall, Virginia, who creates beautiful work from raw materials. Weaver and Fiber Artist and member of the Handweavers Guild of the New River Valley, Meridith Entingh will be demonstrating her techniques of creating one of a kind wearable art. Other artisans will showcase plein-air painting, gourd art, and pottery demonstrations, as well as a pine cone owl children’s craft. Entertainment will be provided by the Blue Ridge Mountain Cloggers at 11am and 1pm. At 2pm, Dance Caller Katherine Lawson will be giving step by step instructions for Line Dancing and Colonial Dancing. Guests will be able to watch some great dancing as well as learning a few new steps themselves. This will be the last weekend that the Blue Ridge Parkway Visitor Center is open for the 2016 season. Our last day for the season will be Sunday, November 6th. We will reopen in April 2017. Don’t miss out on visiting the gift shop to pick up that unique, one of kind Christmas gift for that special someone. The gift shop is always home to a variety of local artisan wares that are available for sale along with Explore Park memorabilia, T-shirts and fun items for the children. We are also the only place in Southwest Virginia where you can buy Belmont Peanuts: Virginia grown peanuts from the heart of Virginia’s peanut region. These are a must have item for those special holiday celebrations or a unique gift for someone on your list. Also on November 5th, you can join in on a hike and come have a ball with fungi. Join our naturalist on the hunt for native mushrooms and learn identification techniques, fungi&apos;s role in VA forests, and maybe a joke or two! Be sure to check the website if you would like to register for the Wild Mushroom Hike. Make a whole day of it and take advantage of Explore Park’s hiking and biking trails and view the historical buildings at the park. Bring the fishing gear and fishing license to spend an hour or two on the Roanoke River or visit the museum located in the Visitor Center. For more information on Artisan Saturdays and Hike registration please call (540) 427.1800 or visit us on the web at www.RoanokeCountyParks.com.